At the risk of their own safety, a group of Māori performed haka at the frontline of the Osceti Sakowin camp. 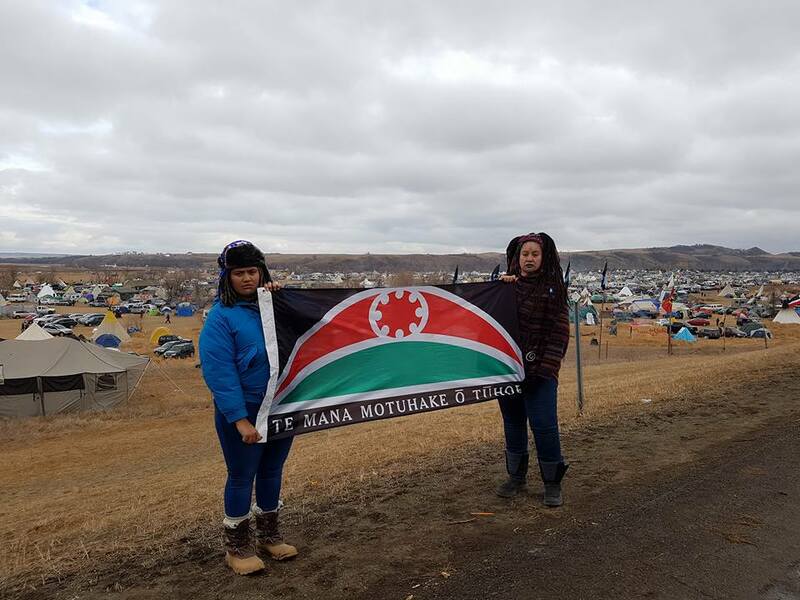 A group of six Māori have been at the camp since last Sunday, in support the Standing Rock’s Sioux tribes’ opposition to the Dakota pipeline. Kereama Te Ua and some Māori women went to pray at the frontline where authorities were positioned yesterday, (Thanksgiving Day). “I didn't think I was going to do it there. 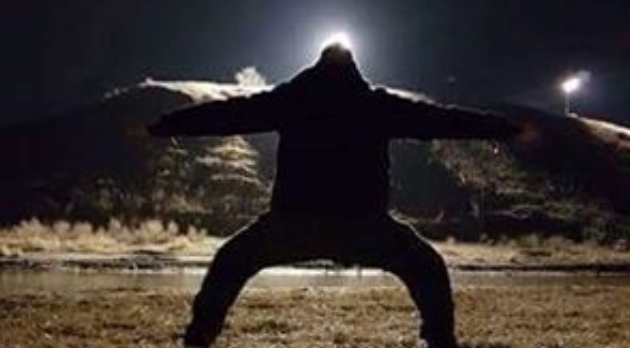 I just had an overwhelming feeling to drop to my knee and deliver something from my ancestors, knowing full well that a haka would have provoked them, they wouldn't understand what it means, and these guys are looking at any reason to take a shot at us,” said Te Ua. For months the Sioux tribe along with thousands from around the world have been camped at Standing Rock, to protest the construction of the underground pipeline, which they claim will pass through a sacred burial site. NOTE: War haka were originally performed by warriors before a battle, proclaiming their strength and prowess in order to intimidate the opposition, but haka are also performed for various reasons: for welcoming distinguished guests, or to acknowledge great achievements, occasions or funerals, and kapa haka performance groups are very common in schools. Responses to "Maori warriors defy authorities with a powerful haka at Standing Rock"
Powerful. Thank you for sharing your strength. The world is watching. May good prevail. May you all find the strength & courage to fight on. This took much courage to perform in a foreign country; on an icy road;and in front of what they know are gun happy police officers; They are coming to support Standing Rock from all over the world..
Love it ... prayers for all! Very powerful ! May the good prevail. Thank you for sharing your spirit. Many Thanks and Blessings to our Maori Brothers and Sisters. WATER IS LIFE! much gratitude to all the protectors! One Mother Earth; many beautiful cultures, one humanity. We must live together with respect for each other, and enough respect for other species to allow a sustainable future. You inspire me beyond words. In this age of meaninglessness this effort is authentic and very real. This action by the police of the country that condemned Castro's treatment of the Cuban nation. The spirits should never be offended. My thoughts and prayers are with you. Powerful and moving. I see and feel the strength and power of the Haka. The world is watching. People with good hearts will do the right thing: with children to feed and bills to pay, it took them a little longer. They now see what is good, what is right and stand With you. And so it is. The world is watching; from australia. Thank you Maori Warriors! What a wonderful Haka! You have come far to help! Many Thanks!! The Whole World Is Watching. Even Though Scumbag Corporate Media Are Silent. Best wishes from all in New Zealand And Australia. We Will Boycott any company involved here. Banks included. My spirit Flys with my ancestors to you, He mea nui o Te Ao he tangata he tangata he tangata! Don't mess with the Maoris -- God bless them! Powerful, the spirit is strong, the ancestors are with us, we shall prevail! Thank you to our Maori Brothers and Sisters! Powerful. Brought me to tears. Stand strong. My spirit supports your spirit and that of your ancestors. We stand with you. Earth defenders the world over are with you in spirit, even if we cannot be there in person. The Maori are known to be fearsome warriors and the Haka moves me to tears everytime I see it. That raw courage of standing in defiance of such twisted authority is typical of the Maori. Thank you all for your courage and authenticity, to the Maori and all of the Indian tribal warriors and other defenders. The earth depends on you all. May the spirits be with you all. We watch from all over the world, Distance seems great, but in spirit, we never parted. I see, I hear and feel. Eyes open every morning , perhaps tommorow , the right set of Eyes Will open too. Keep standing firm and call upon Dawn. Water is life. Your stance is a righteous stance and you do not nor will ever stand alone on this. Peace to you brother and sisters.